Happy Monday! 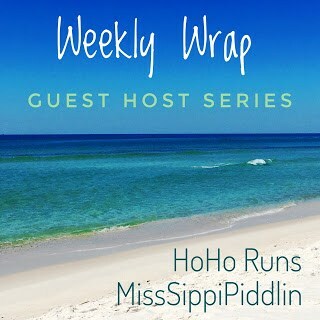 It’s time for the Weekly Wrap with HoHo Runs and MissSippi Piddlin, and guest host Deborah! The weather was pretty miserable, so we just decided to go bowling and run errands. It was a nice way to spend an afternoon. I’ve been working on setting up a quiet homework/study space for little man in our mostly unused home office, so it was nice to have spare time for that. I was back to work, but we had plenty of fun planned in the days ahead. I finally got in a nice, solid 5 mile run. Temperatures are still pretty brutal, but it is what it is. Little man had his first day of Apple Camp. Our local Apple store offers free camps and classes, and I was really excited to be able to score a spot in this one. It was three, 90 minute clinics with the goal of animating some original characters with iMovie and Garage Band. From what Mr PugRunner said, Day 1 went really well. After work, I picked up little man to take him on a little adventure. One of his summer bucket list items was to go zip lining, and the local zip line course was offering a really incredible resident discount for the month. We had already checked the place out so we knew he would be able to handle it and Wednesday was the day. It was ridiculously fun. My last zipline adventure was more of an adventure course with tightropes and slack ropes and all kinds of terrifying ways to get to the zips, but this was much more basic: seven zips, four or five bridges and a few ladders. It was also fully guided, meaning that tour guides climbed and zipped with us, and handled all the clipping on and off as we went. I loved that I didn’t have to worry about anything. I also loved that little man, our cautious, non-daring, feet-on-the-ground, child, loved it, too. He didn’t balk once, and I was so proud of him for doing such a great job. There was one platform where you had to “walk the plank” instead of squatting, leaning back and releasing, and even I had to take a minute to work up the nerve, but he just stepped right off and went for it. I had a little bit of a sore shoulder (where I zipped in a little too fast on one of the bigger lines), but I was able to bang out five miles. Yay. This time, I got to go to Apple Camp, and it was a blast watching all the kids let their creativity work. After it was over, we got lunch together and then we did some back-to-school shopping. We needed some new gear for Cub Scouts (he’s moving to a different shirt color) and I had to get my leader manual. I hope I’m up for the challenge. For the final day of camp, the kids did their final presentations. It was really cute to see all the completed movies. Everyone got a certificate of completion and a flash drive of their short movie, too. and then it was off to our friend’s neighborhood to swim. When we got home, Mr PugRunner was already at our pool, and so we grabbed fresh towels and joined him. Our neighborhood had Food Truck Friday that night so no cooking for this girl! Whee! Instead, we had some super tasty kebabs. I just couldn’t get myself up and out, making my miles for the week fairly disappointing. To be honest, I spent most of the day lounging and reading I didn’t want to go to the grocery store or do much of anything. In the evening, we had a birthday party/open house at a friends’ and that was the extent of our day. I am looking forward to (or not) some pretty crazy scheduling in the weeks ahead. It’s to the point where I broke down and got a huge wall calendar so I can keep track of everyone’s activities (color-coded, obviously). It will hopefully help me get my personal blogging back on track, too. Additionally, I am good to go for the Rock ‘n’ Roll Marathon Series Summer Strides Virtual Run (thanks to my affilitation with Rock ‘n’ Blog). There are some great medals, depicting the history of running. Participate in all three virtual runs, and get a fourth, bonus medal, too! This will be a good motivator for me. And, of course, code RNB15 gets you a nice discount on select Rock ‘n’ Roll Marathon Series events. Next week is back to school for our area, and so I’m going to be pretty swamped. Fingers crossed that I can get everything accomplished! Another busy week! Apple camp sounds pretty awesome. Believe it or not, I ran twice last week! Just one mile the first day and I somehow survived three the next time! It wasn’t quick by any means, and I walked the last part of a couple hills, but it wasn’t nearly as awful as I remember. Hopefully getting back on track finally. And as for ice cream before lunch… There’ve been a few times I have it for actual dinner! Whoo hoo!!!! So glad for you! Another great week of workouts for you. I love that you went ziplining! I’ve always wanted to try it! I’m also doing the RnR Virtual Run series. Those medals are just so darn cool! Zip lining is so much fun but stresses me out. Last week was okay for training, this week I’ve yet to get out the door! I think ziplining would be awesome fun! And your ice cream is drool-worthy. Hope you have a fun August! I’m a bad Rock ‘n’ Blogger–I just don’t dig virtual runs. I don’t want extra bling. But those medals are cute! Looks like you are enjoying your time with your guy! The zip-lining looks like a blast! That’s something I want to do sometime! Kimberly Hatting recently posted…Road signs…are runners exempt? Why not just have ice cream FOR lunch 😀 Sounds good to me! Zip lining is the best! I did it a few times when I was a kid (terrifying) and then as an adult (much more fun!). I’d love to do it again! Ziplining and Apple Camp sound like a blast. Great job on all your runs too! Looks like a great week! Zip lining looks like so much fun!!!! I have yet to try it, but I want to! It is so hot here, here’s hoping the weather starts to cool a little…..not likely though. Zip lining with your son sounds like a really fun experience. Glad that you were able to cross that summer bucket list item off of his list, especially since the start of the new school year will be here before we know it.